Today, with the release of Infragistics Ultimate 17.2, we are expanding the features and functionality of our popular UI control suite for web, mobile, and desktop development. Additionally, we have added new developer productivity tooling and enhanced UX prototyping and usability testing functionality. As we shared a few weeks ago, we are really excited about our new Ignite UI for Angular component set. It features 30+ True Angular UI Components including our popular Data Grid, an easy-to-use API, and the ability to quickly deploy your mobile applications through GitHub and NPM. Use native Angular controls to build PWAs to deploy across web, mobile, and desktop. Click here for directions on how to install Ignite UI for Angular. Start your designs in the Sketch app and use the new Sketch plugin to export to an Indigo Studio project. Not included in 17.2 -- Use Indigo Studio On-Prem and Indigo Server to collaborate securely within your corporate firewall. Learn more on the what’s new blog here. Modernize the way your desktop apps display data with our new lightweight and high-performing Category and Funnel Charts. Use the new Bullet Graph, Linear Gauge, and Sparkline controls to display data in a linear format. Learn more on the what’s new blog here. Visually configure grids, charts, and gauges with new Control Configurators. Royal Light Theme is a long-requested lighter version of our popular Royal Dark theme. The WPF Data Chart now includes Shape Charts, Scatter Area, Contour, Polyline, and Polygon Series for rich visualization of X/Y coordinates. Learn more on the what’s new blog here. New and improved controls in Xamarin include Doughnut and Funnel Charts, QR Barcode, and new day and week scheduling views. Control Configurators simplify property editing, data binding, and more. Learn more on the what’s new blog here. More than 2 million developers use Infragistics' enterprise-ready UX and UI toolkits to rapidly prototype and build high-performing applications for the cloud, web, Windows, iOS, and Android devices. 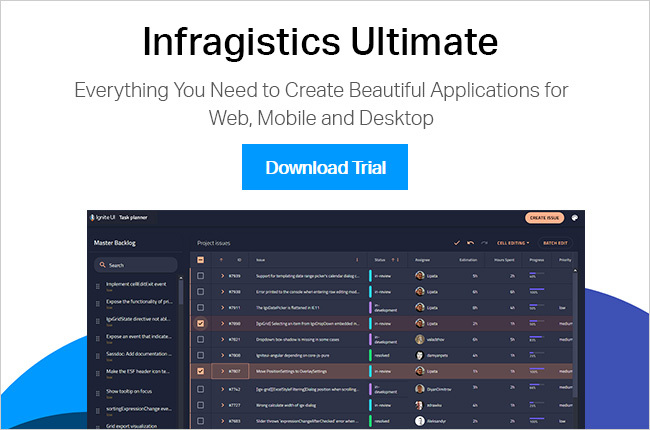 Download a free 30-day trial of Infragistics Ultimate 17.2 and start building your best experiences today!